We had Crazy Soup, multi-fruity pie, and another scavenged salad (this time -- watercress and kale florets, with leftover rhubarb dressing). Crazy Soup is leftover bits of savories from our dinners. Some onions browned in bacon fat, bits of ground beef and onion from forming hamburgers, liquid and trimmings from "juicing" canned tomatoes, canned vegetable liquid, liquid from thawed spinach, broken pieces of dried-out tortilla, a spoonful or two of different cooked veggies, and an extra container of some sort of "meat" gravy. After each night's dinner, if there's not really enough of anything leftover for a portion, I scoop whatever remains of dinner into a quart-sized container that I keep in the freezer. 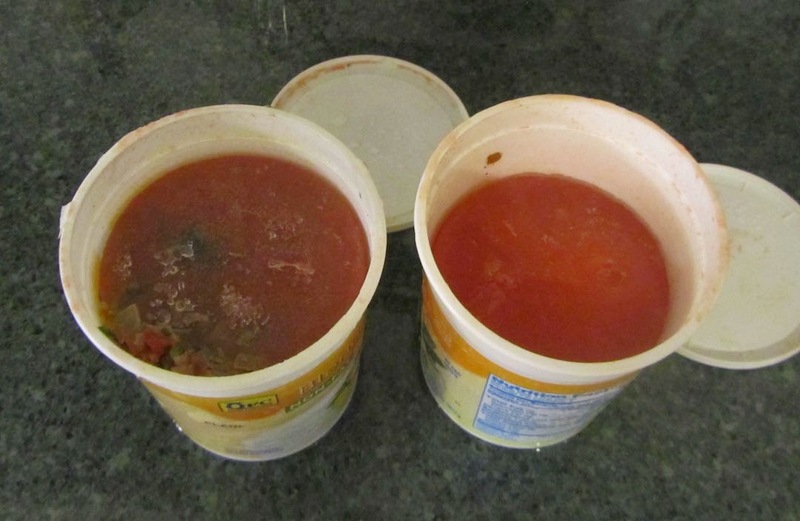 When I have 2 of these containers, I thaw them, dump into a stock-pot and add some cooked beans. Sometimes I need to amend the seasonings. This time, it was flavorful enough to simmer it until thickened, and add a pinch of salt. And that's our Crazy Soup! 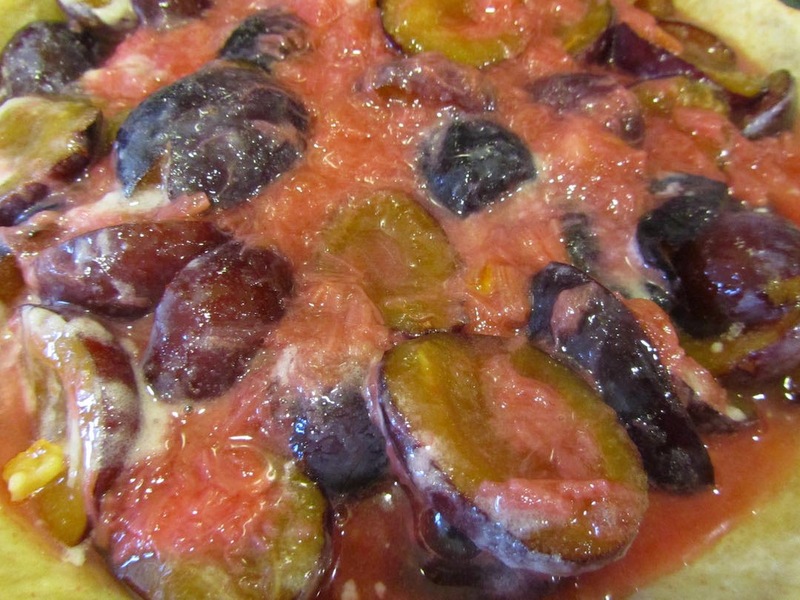 The multi-fruity pie began as a plum pie, with frozen plums. I found some over-candied orange peel, the liquid from thawed, frozen strawberries (from last weekends brunch), and about a cup of leftover rhubarb sauce that no one seemed interested in. I added all of these found ingredients to the plums. Then sprinkled with a mixture of sugar, flour and pinch of baking soda, and tossed it all together right in the pie shell. The pie was absolutely delicious -- however kinda soupy. It could have used more flour in the mixture. I was very tired from a busy weekend, and this was just the sort of dinner I felt up to pulling together. True, not gourmet, but still good enough. And sometimes, good enough, is "good enough". Maybe tonight I'll have more energy to make a "real" meal. Sometimes you just need a meal like that after a busy time. We had "lomo saltado" which is a Peruvian dish. We had all the ingredients in the house so my daughter walked me through how to make it. She spent a semester abroad in Peru and liked their food. We left out the spicy hot peppers since we only like a little bit of heat. I was going to have baked chicken but it was still frozen but I baked it anyway since the oven was hot. That is tonight's meal with something but I don't know what yet (maybe a salad since it's starting to turn brown). Thanks for saying that. I sometimes put too much pressure on myself to turn out great dinners, night after night. I'll have to google lomo saltado. How wonderful that your daughter could spend some time in another country learning about their customs and foods! Thank you! There's a certain satisfaction when making a meal for so little, that I think only us frugal folks understand. And definitely good enough! That meal was not only good enough, it was GREAT! You used up leftovers and everyone was happy. I don't know how you can get much better than that. And actually, even though the pie was soupy, it had amazing flavor! I gave the last slice to one of my kids for lunch tomorrow, but I keep thinking about how much I enjoyed it. So maybe some parts of dinner were more than good enough! It wasn't nearly as much work as making dinner from scratch. I keep pie shells ready to bake, in the freezer. And that pie was an open-face one, so pretty easy. And the soup was just dump and stir. I love those sort of dinners! But I see your point to just using up the leftovers until they're gone. I know that must work well for you. So, as they say, if it ain't broke . . .
And you've found how to best deal with your own leftovers -- so that's very frugal. turkey-ham-mushrrom tetrazzini along with roasted carrots. Pretty yummy if I do say so, myself!